The elves in Santa's workshop have finally had enough of the jolly red man's tyranny, and now they want to make some money as an RnB supergroup. Click here to play! Toy Monette and Sarah T Elf do backing vocals, while MC Jester lays down the rhymes. The elven beatbox Master Moxie is the front man of the band, the one who lead these rapping elves away from the talons of Santa Claus and into the limelight as Gift Rap. This band is done making toys, just for Santa to get all the credit. Now, they want to market their own line of toys, featuring rubber mallets made of gold, spinning tops made of gold, teddy bears made of diamonds, and Rappin' Jack Frost jack-in-the-boxes. You bet check yourself into the Gift Rap slots before those other sucker MCs grab all that elven bling for themselves. It's a hard life in the workshops of the North Pole, but Gift Rap will rise above to make more cash than Santa Claus could ever dream of. Get a piece of that action before the band gets signed to a big record company that will squeeze them for every cent their worth. The Spray Paint symbol is a scatter symbol that pays out on the total bet when 3 or more symbols land on the reels. 3 symbol payout 5 times the bet, 4 symbols payout 20 times the bet, and 5 symbols payout 80 times the bet. The Gift Rap Bauble symbol is wild and substitutes for any symbol other than scatter or bonus symbols. The Rappin' Jack Frost symbol is a bonus symbol that triggers the bonus when 3 or more land on the reels. 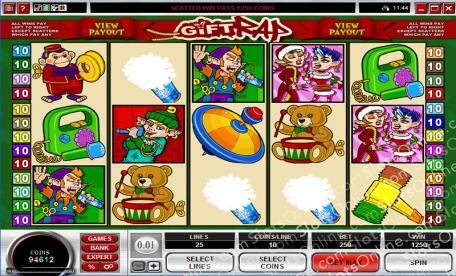 In the bonus, the player chooses gifts that reveal prize values from the 30 onscreen until a Rappin' Jack Frost symbol ends the game.